Answer: A Smart Phone or Tablet ! 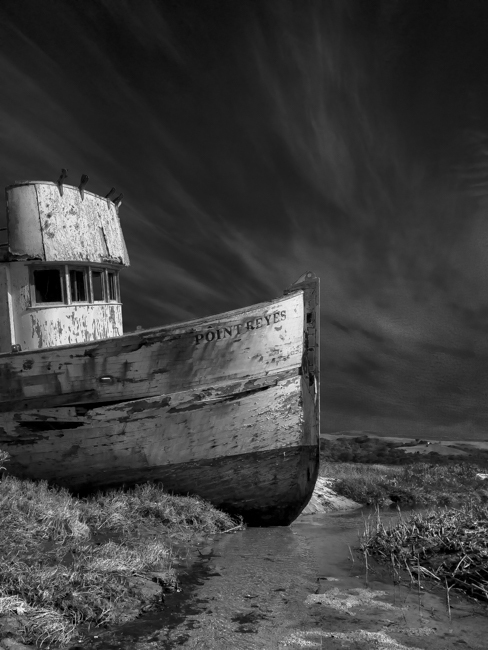 Not long ago I was conducting my workshop out at one of my favorite locations, Point Reyes National Seashore. 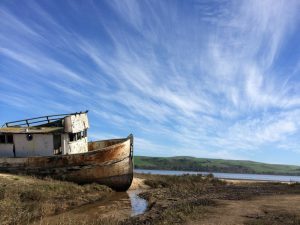 One of the first places I take folks is to this old boat, aptly named the “Point Reyes”. I have been photographing this old boat for almost 20 years now and in the last year, it has been disintegrating rapidly. I fear it won’t be long before it is no longer photogenic nor a good teaching tool. I will sincerely miss this “The Old Girl” when the time comes. The reason I take folks to this location is to discuss various techniques such as composition and looking for textures, shapes, and tonalities. All integral parts of making an image. In an attempt to “show” what I was talking about, I made an image using my iPhone 6. I did a quick edit in the phones’ app and showed it to him and “Boom!” he saw what I was talking about. Literally, within seconds, the concept was delivered. You can use your Smartphone or Tablet as a great “in the field” tool to not only help you envision a scene but capture a great image too! Using a handy tool (smartphone)…Taken and edited with an iPhone 6….